Item sold is image on left only. Larger size sold separately. 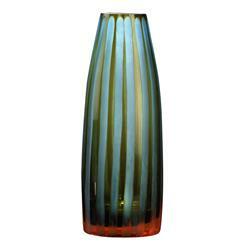 The art of chiseled glass is brought to life in vivid shades of cyan, orange and sea-glass green. Vertical chiseled stripes create the color variance, while the spare silhouette creates a shapely stage for this color play to come to life. All contemporary spaces - especially mid century modern ones - will find this an artful and welcome addition.